Live so that when your children think of fairness, caring and integrity, they think of you. I stepped into a teaching position at school that was recovering from a horrific bullying incident. Incident doesn’t quite do justice to this life-changing event; life-changing for the instigators and their families who faced court, certainly life-changing for the victim of the attack. A group of boys thought it would be … I don’t know … fun? … to abduct and torture a classmate, a peer, a fellow human being in bush-land near the school. For hours they tortured him, pissed on him, tied him up, made him dig his own grave, psychically assaulted him … He was a vulnerable kid – skinny and small for his age. They were taller, bigger, stronger and had a lot more friends. I have found myself thinking about this event a lot over the last week or so – particularly in relation to the ridiculous language and downright disgusting behaviour of the so-called leaders of this country. It is bad enough that our Prime Minister is using such juvenile, throwaway language better suited to a “jock” in a John Hughes film than serious humanitarian issues; it is incredibly disturbing when we consider the actions of Scott Morrison and the government. 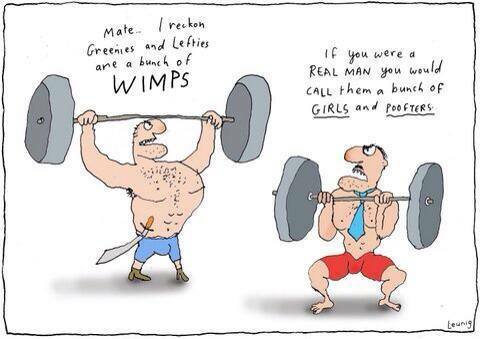 By Abbott’s standards I would much rather be a wimp. In Abbott and Morrison’s world, a strong and decent person is one whom persecutes those who most need protection and support and assistance. By these standards, a strong and decent person is someone who is cruel. What does this mean in the playground? I’m not even sure the word ‘wimp’ is still part of the colourful vocabulary of school-yard bullies but let’s imagine, if you will, that it is. “Don’t be a wimp” translates to don’t defend that kid who needs your help, stick with bullies, hurt him, he deserves it, he is the minority, he is different, he doesn’t deserve friendship / kindness / help … No one wants to be a wimp because, clearly, it takes integrity, strength of character, compassion to be a wimp. It is difficult to be a wimp. I wish there were more wimps in the school-yard. If there had been some wimps around on that life-changing day at that school by the bush then maybe a child would not have suffered. Maybe one of those bullies would have had enough wimp in him to stop his friends hurting an innocent, vulnerable kid. If there were more wimps running this country then maybe Reza Barati would still be alive. Maybe we wouldn’t lock up the vulnerable who have turned to us for help not persecution. Maybe we wouldn’t be creating a country that is intolerant, cruel and selfish but a place that values equality, peace and compassion. I said that to a group of people I barely knew the other night at a dinner party. You know those dinner parties where suddenly the conversations actually become a little meaningful simply because you’ve all run out of that superficial stuff … and there’s been a lot of wine consumed. Anyway, I announced my shame to the table. “That is such an Australian thing to say,” replied one. I really had not meant that I took this place for granted, that the opportunities and safety and lifestyle that Australia offers to many are extraordinary … No. Not that. I am ashamed that I live in a country where opportunity, safety, the ‘lifestyle’ we go on and on about ad nauseam, is only available for some not all. And all of those there at that dinner party, drinking wine and attempting to forge some meaningful conversations, were part of that some. The recent politicising of asylum seekers has fuelled my shame of the deep divide and the mountainous contradictions that are Australia. There are the Cronulla Beach Riots. There was (still is; just with a less obvious name) The White Australia Policy. There is the untold history and continued mistreatment of and horrific injustices against our Indigenous population. There are the shock jocks. There is the “she’ll be right” attitude. There is the myth of mateship and the ANZAC-spirit and the fair go. And now there is a government who will not allow any refugee who arrives by boat to ever settle in this country. Ever. Australia is a spoilt-brat. It is an obnoxious, selfish child who stamps it foot and demands everyone else do the work so it can continue lying on the beach and working on its tan (so long as it doesn’t get too dark, Australia doesn’t like that). It’s time for Australia to grow up and realise that the world doesn’t owe it anything. We are seeing an islamic [sic] invasion into Australia one boat at a time. We must make it as difficult and unpleasant as possible for the detainees otherwise we shall see hundreds and thousands of Muslims coming to Australia and ultimately wrecking this country with their radical islamic [sic] agendas. Islam is not the relgion [sic] of peace ………..but the false relgion [sic] of death and suffering. If these people had half a brain they’d realise Australia is not set up to handle the plauges [sic] of illegal boat people flooding our shores. It’s 100% there [sic] fault and blame lays [sic] solely at there [sic] feet not Australia’s. Their [sic] getting there [sic] reward , for there [sic] sly and under handed entery [sic] into or turf [sic]. No pitty [sic] coming from me. My husband (along with lots of others) works in PNG He does not have airconditioning, and thanks to the Labor govt he now pays double tax (something they introduced if you work overseas), If [sic] you think we are happy about supporting you illegal maggots who come here and demand this and demand that, and then tell us your offended. The majority of Australians would be quite happy for you to go back home. Our boys are over in your countries fighing [sic], and you flee and come here expecting what!!!!!!!! None of these boat people were invited to come to Australia. In fact, they are invading our Country and I could care less about their situation [sic]. They are not refugees [sic], they throw away their passports so we don’t even know who they are. Let’s hope for a change in Government so we can, once again, protect our boarders [sic]. We have many struggling Aussies and they should be getting our billions of tax dollars, not these parasites. I could post these all day but it is depressing and I’m getting a little tired of having to add [sic] to every sentence they write. Ill-educated, ill-informed and ill-mannered. Maggots? Parasites? It seems many Australians have a terrifying sense of entitlement simply because by some twist of fate they were fortunate enough to have been born here: “we grew here, you flew here” they cry. What the hell is wrong with these people? You did nothing particularly special nor clever to be born, you had no say in it, the least you can do is offer your compassion to others who also had no choice in being born but , through some twist of fate, ended up in a country where they are prosecuted or tortured or hungry or live in a constant state of fear. We cannot imagine that. We’ve never had to deal with that. We are from the ‘lucky country’. Of course, not every Australian is so lacking in empathy but it can sometimes feel that way when you look at the Newspoll results. But is this shame I feel simply limited to the fact that I happen to be an Australian? Would I feel less shame if I was from somewhere else? In Canada they treat asylum seekers like prisoners. In France, the government continues to restrict the rights of asylum seekers and migrants. In Greece, Golden Dawn are proving very popular with the locals. Maybe I am simply ashamed to be human? Ashamed to be from Planet Earth. Next time I am at dinner party and the conversation moves from that superficial stuff, and if I have indulged in enough wine, I will announce that: I am ashamed to be from Earth. “Oh, that’s like such an Earthling thing to say,” one of my new acquaintances will reply. Maybe if more of us were ashamed, from whichever nationality fate has us born into, there would be more of a call to change and we would be working towards policies that make us proud of our citizenship and place in the world … Proud to be a human-being.